I'll soon (hopefully) will be in the market for a front engine Porsche and, in my opinion, the two best cars in that category are the 928 and the 968. I am wondering what the opinions of the forum are and if I could get some pros and cons of each. I currently have a Corvette which I will be putting on the market to assist me in my purchase. I like the looks of both, and frankly, that's probably because they look quite similar. The 928 is appealing because of the power but a detractor for me is its GT like nature, as opposed to a sports car such as the 968. I've always been a 944 turbo fan but the body on the 968 is beautiful and notwithstanding the turbo S, has more power. My concern with it is its power, however, as it only has a stock rating of 236. I'm not against modifications that net decent gains with little invasiveness but can one expect close to 300 naturally aspirated, reliable HP out of a 968 without tearing the lower half of the engine apart to get it? I'd love to know what everyone thinks. depending on your budget for purchase and maintenance, and how you intend to drive the car, should be the determining factor for this decision. a 968, being a 944 derivative, is a very good car. the power number sounds low compared to your corvette perhaps but it certainly feels and drives like there's plenty there. it is nice to ride in around town and on long trips. a 928 is all that and more. way more power, more comfort, less noise, heavier feeling car. most were automatic, something like 1/3 were manual. they are more expensive to keep up though, some things by a long way. 300HP would put you in the euro S 16v or any of the 32v 928 cars. get the newest one you can afford, there were a lot of improvements made over the 928 run. the 968 was an evolved 944 with a stiffer body, some more sound deadening and variable valve timing for higher power, fitted with the brakes and suspension of the 951S/944S2. both cars have shells dating to the early 1970s, but the 928's suspension was borrowed and evolved for the 911 cars into the 90s whereas the 944/68 borrowed from the 1930s. Just drove my first ever 968 last week. I was really surprised how similar it felt to my 944. Little more refinement, not much more torque, with the only real difference in power being felt high in the rev range. Ran it to redline in the first three gears and have to say it was a rush, about as quick as my 986. Fun but not as much of a standout as I expected. The 928 is IMO one of the best sounding cars ever. Just like you remember from Risky Business. I'm particularly fond of the early models, purity of design I guess, plus they can be found with Pasha interiors. Have had wheel time in a '79, and an '84, both sticks. Much as I like the 924/944/968 series, they just don't have the same WOW factor that is so vividly etched in my mind driving the 928. Flip side is figure double the maintenance costs and half the fuel economy for the 928. My 944 excels at being an economical, reliable daily driver. Not sure the same could be said of the 928, so it really comes down to what you're looking for. I have had an 84 928 for several years as semi daily driver. got it when I was morphing my 85 911 Targa into a DE/street car. retired the 911 from the track and returned to top off pleasure driver. picked up an 86 951 project to be my next DE / street car. finished installing a rebuild engine, so far have not driven hard as still breaking in the motor. I LOVE the 928 as a GT driver. these older 16V 928s aren't real fast off the line but will eat up the miles at autobahn speeds in comfort. and you will almost never see another on the road, gets a lot of looks and thumbs up. as I installed headers and full 3" exhaust with magnaflows when doing a full rebuild of the front suspension/MM/etc, it is a bit loud but love that. growl grows to a howl as rpm increase, and sounds faster than it is. but still no slouch. I decided on it as I wanted an auto for DD and the 83-84 had the 4sp auto and the 16V for less complicated maintenance. once you move up into the 32V cars, especially the S4 and up, they get faster, but more complicated and expensive to maintain. and get / feel heavier than the early ones. when I got my 928, first two years went through and refreshed the whole car. has pretty much been a turn key, reliable driver for the past few years. and ice cold AC. I also love the 951. more tossable, nimble feel. a little more snug fit but still very comfortable. the 968 is a great car, but if you really want 300+ hp, you can get that easily in a 951 with bolt on upgrades. I did quite a few upgrades on the 951 along with a full 3" exhaust going for about 300hp. good sound for a 4 cyl/turbo, but just does not compare to the sound of the 928.
you really need to understand the 928, 968, or a 951 are all high maintenance cars. and all aging. if you cannot do a lot of the maintenance yourself, you will want to get a well sorted car with all major maintenance up to date. you can find 'cheap' 928s and 951s, but may cost more to refresh to the level you want than finding a good one. in my case, I enjoy the wrenching part, so I do not shy away from a good car with potential. 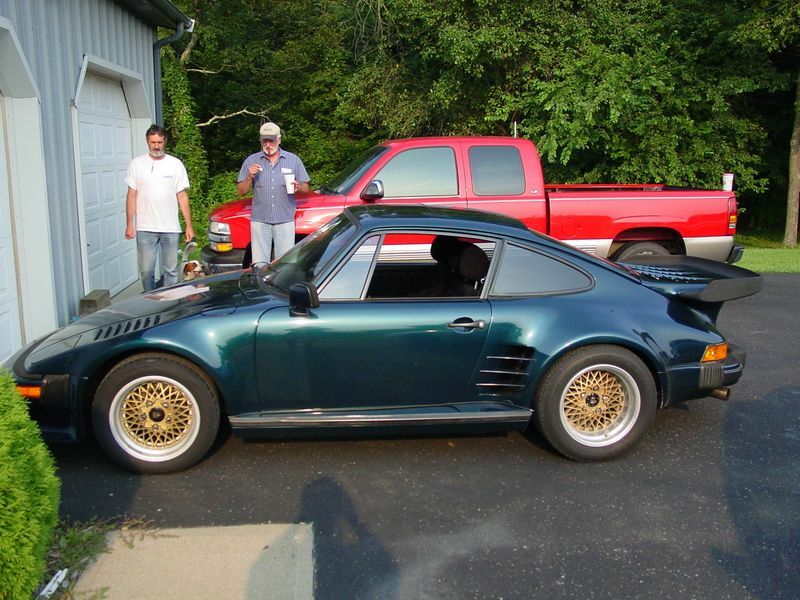 now that I have 3 running Porsches, and about to dive into a full refresh on the 78 930, need to consider selling one. 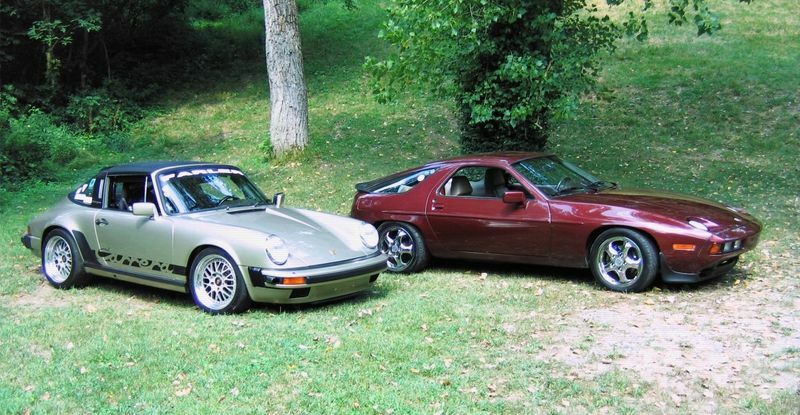 if I do, it will probably be the 928. and once the 930 is done, will probably sell the 911 targa. , but wish I did not have to sell any of them. and now for the eye candy. the 968 is really a GT too. it's frankly too large and heavy to be a sportscar, and besides, it has a back seat, which disqualifies it from the onset, let alone the roof. to answer one of the first questions, no, you cannot expect to get anywhere near 300hp normally aspirated in a 968. you can expect to get 260 to 265.
don't be misled about the 951 either. while it shows a small amount more hp than the 968, in stock trim, the 968 will be faster on the track. the power is easier to use, and has a wider torque curve. that being said, 50 of us are out there running supercharged 968s, CARB legal, with a bit over 300 hp, but more importantly about 300 lb/ft. we have been now for over 3 years. there is no substitute for V8 grunt though, and the 928 is a much smoother and quieter car on the highway. as said, all of these cars are old. expect things to go wrong. I have owned several of both... first things first, with the 968 you will not get close to 300hp with out major engine modifications, but that said its got a few good power curve. with a few suspension mods, 968s can be very fun cars to drive. P.S. That is a beautiful 928 911tracker 85!! 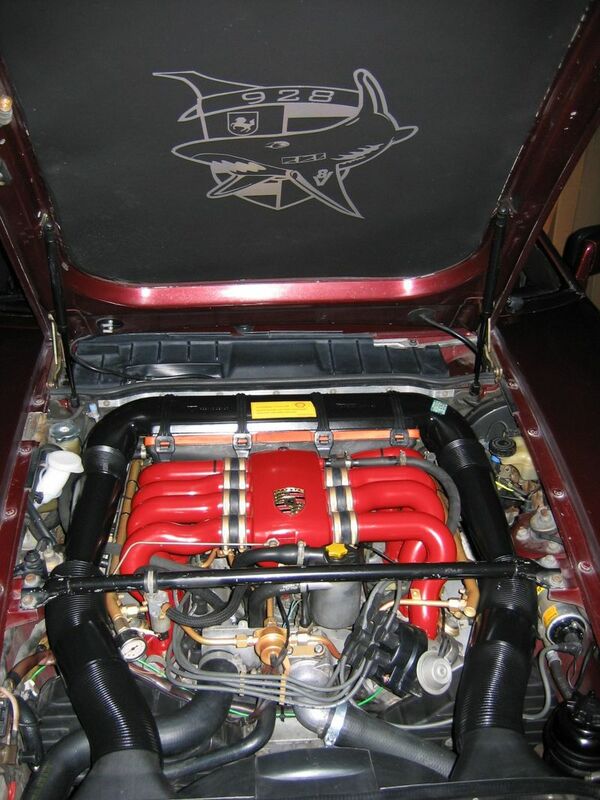 i just installed another supercharger on a 968 today. rather unique car. lambo doors. i took one just before he left. i'll put it up tomorrow. Thanks for the great feedback! My intent is to use the car primarily on the road, but occasionally at track day events, as well. I want something I can work on myself and coming from the 1970's 'Vette world, a Porsche will probably carry a steep learning curve. With a growing family, the ability to stuff a kid or two in the back trumps the 'Vette, too. 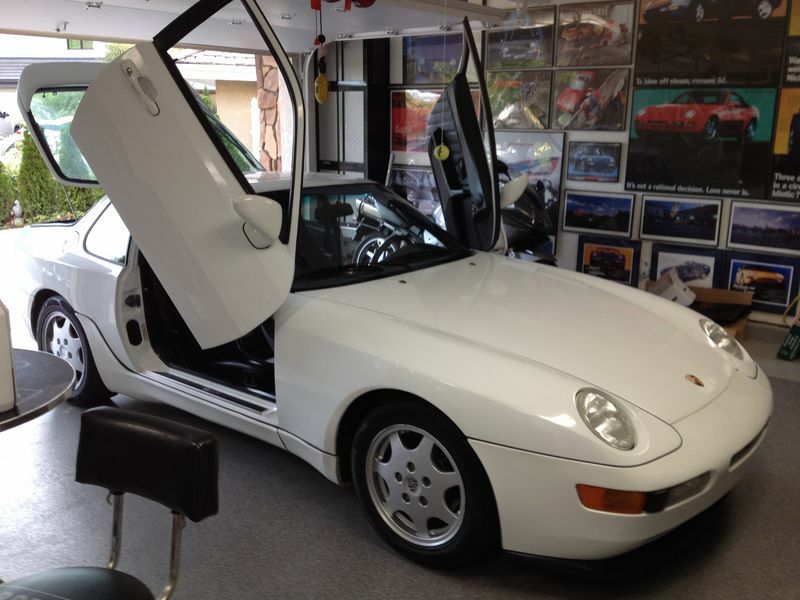 If I go with a 968 and can't get much power out of it, then I'd probably resort to weight reduction. you can get the first 100lbs out of the car pretty easily, but after that, it starts getting hard, and expensive. maintaining some form of street civility limits how much you can pull out, but you can get down close to 2800lbs if you really go at it. Flash, I hope you don't mind that I posted all of those pictures! That's pretty cool! Seems like Lambo doors really only work in certain colours. White it fits. But others look weird. I have both cars and have had a few of each. I do not really think there would be many people who could not decide this for themselves based on what they like and want. If you want power, get a 928, particularly an S4 or newer as you can get 400-500HP without trouble. If you are OK with stock power (which IMO is fine) there are a lot of 300HP versions. I feel like I am always driving the stock 968 hard to get acceptable performance while the 928, not so much. Much more effortless/endless power delivery. Bolt-ons do not get the 968 anywhere IMO, you need forced induction at a minimum and that is expensive and problematic. A V8 swap would be great in the 968 but that is a whole 'nother bunch of issues and a big pile of money. I do not think the 928 is that much heavier and less nimble than the 968, if it is perceived as such I feel it is mostly due to suspension and alignment settings, and the underboosted power steering in some 928s. 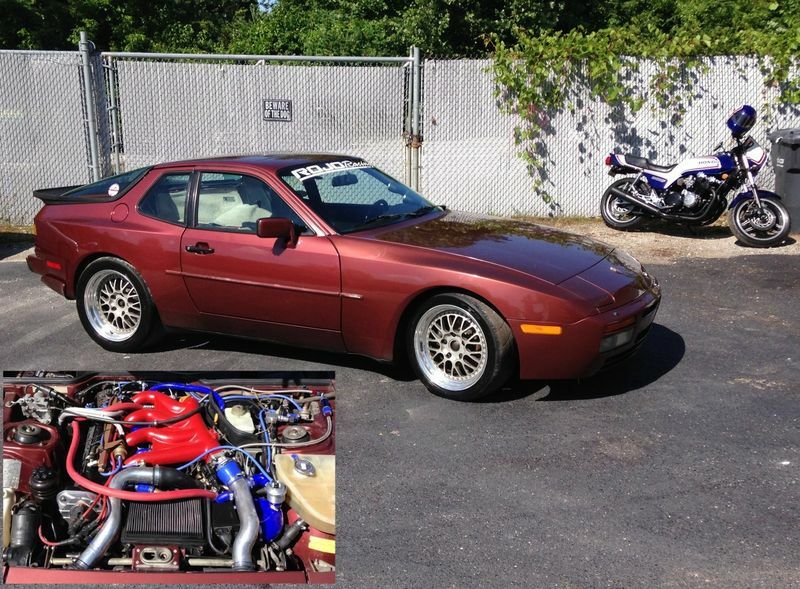 The grocery getter overboosted steering in the 944/968 IMO is a negative. Tire choice is also a big factor. They are both great cars you just have to decide what your priorities (and budget) are. If not for the convertible I do not think I'd have a 968 myself, but someday maybe I'll swap in a V8 and then I might not need the 928.